TENS OF THOUSANDS of working people marched through Athens last Saturday demonstrating their support for the Greek Communist Party (KKE) and workers’ rights. And communists from every continent joined hands with them under the slogan “The Olympic Games are over – but class struggles continue”. Workers and the Greek youth dominated the march through the heart of the capital following a rally addressed by Greek communist leader Aleka Paparigha, and comrades from Cuba and the Palestine People’s Party. Greek workers’ living standards and union rights are under attack from the recently elected conservative New Democracy government and this has been intensified in the name of the 2004 Athens Olympics, which the Greek government used to promote its reactionary class agenda. Thirteen workers were killed and hundreds more injured building the Olympic complex. No government official or employer has been jailed or even charged with negligence. Everyone knows that top government officials and multinational contractors made fortunes out of it. The building workers paid for the Olympics with their blood. The entire Greek working class will pay for it for years in increased taxation to pay for the losses made in the running of the Games. Militant Greek trade unionists will not forget the workers who died building the Athens Olympics. Their deaths underline the inhuman face of capitalist exploitation and the hypocrisy of the government and employers, who have transformed the Olympic spirit into a business deal to amass more profits. Today Greece is preparing to take an active part in imperialist plans for the occupation in Iraq. The opposition PASOK social-democratic party plays into their hands by focusing their opposition on secondary matters of lesser importance. 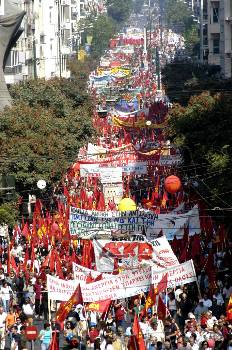 Delegates from 64 communist parties suspended an international meeting of communist and workers parties taking place that weekend in Athens to join the rally and march. The three-day conference on the theme of “Resistance to Imperialist Aggression” naturally focused on Cuba, Korea, Venezuela, Palestine and Iraq with contributions from communists from the ruling parties of Cuba, Korea and Vietnam, delegates from the mass parties of Brazil, India, Bangladesh, Portugal, Spain, the former Soviet Union and the Czech Republic. Parties born from the anti-revisionist struggle included the NCP, which was represented by General Secretary Andy Brooks and Richard Bos of the Central Committee. Many speakers noted the vicious attack of neo-liberal policies on the social and workplace rights of working people, with the principle victims being young people and women. They noted that poverty and the concentration of wealth have risen, while the increasing burden of external debt suffocates the people of the developing countries. Delegates referred to the increasing restriction of democratic rights and freedoms in the capitalist world, the increasing oppression and victimisation of immigrants and refugees. They rejected imperialism’s attempt to characterise the peoples and national liberation movements as “terrorist” and upheld the people’s legitimate right to resist occupation, and expressed concern at the rise in anti-communism, religious fundamentalism, racism and neo-fascist groups. The reactionary nature of the European Union and the divisions amongst the imperialists themselves, especially over the invasion of Iraq, was discussed over the weekend and a major theme was the global anti-war movement and the Iraqi peoples’ resistance to the Anglo-American occupation. NCP leader Andy Brooks called on communists to rally in support of the socialist states, the revolutionary movements and the peoples of the world fighting Anglo-American imperialism and their lackeys in Afghanistan, Palestine and, above all, Iraq. “The issue is clear,” he said. “The Iraq war was an illegal and unjust war. British troops should never have been sent to Iraq in the first place. They must be brought home immediately. “The Iraqi people’s legitimate rights to independence and the control of their resources must be upheld. The Iraqi people have taken up the gun in a new fight for independence. Their resistance must be supported”. ADAIR TURNER, who headed the independent pensions commission, presented his report on Tuesday morning. It concluded that the pensions system will not be in crisis for another couple of decades but if we want to prevent a growing disaster after that, we must act now. He gave four options: one, that we should carry on as we are and resign ourselves to the elderly facing serious poverty in future; two, that we should raise taxes and increase the state pension; three, that we should all save an awful lot more in private or Government schemes for our retirement and four, that we should all resign ourselves to having to work longer before we get our pension. He then said the first option is the least desirable and then went on to discuss the possibility of a mix of options three and four. Guess which option wasn’t even discussed? The only option that is socially just is option two: to raise taxes on the wealthy and raise the basic state pension. Adair Turner did admit that among western nations Britain has just about the poorest state provision for pensioners and that Blair has already decided to run it down even further. He also admitted that there is increasing risk in private pensions and that people are losing faith in them after various scandals and stock market falls – and that those who have lived all their lives on low incomes have little motive to save so long as the Government pensions provision is means-tested. Those who have saved will end up with the same miserable pension as those who did not. When the old-age pension was first introduced it was described as a pledge between generations. Those who began to receive it for the first time had paid into no scheme but their work had helped to create the general wealth of the nation and they deserved to be well looked after. Their pensions were paid by the contributions of the working generation at the time, in the trust that in time the next generation would pay the taxes that would fund their pension. Now it seems the Government wants to break this pledge so that future tax payers will not fund our state pensions – we must fund our own pensions by saving now, giving finance companies the chance to make a good profit while they “take care” of our savings, and keeping taxes low for the rich. Workers are now expected to work all the hours they can, to repay student loans, buy houses at exorbitant prices and save for their pensions. At the same time they must help to keep the economy buoyant by spending a lot on credit cards and running up massive debts. They must work themselves into the ground and then face a bleak old age, selling their houses to scrape by. This is a very wealthy country; it can easily afford to keep increasing numbers of pensioners in comfort. The argument about too many people living too long is a red herring. Modern manufacturing, wealth producing processes are highly capitalised. New technology has increased productive capacity by leaps and bounds. The work of a smaller number of people can easily produce enough to keep us all well off and provide more leisure for workers. The problem is that that wealth is concentrated in the hands of a greedy few who want it all for themselves. That is why we must reclaim, through the tax system, the wealth created by the workers for the workers to keep them in their old age and when they are sick.